This page is best viewed using the WoWI "default" or "dark" theme. Apologies for any inconvenience. The following is adapted from the original project description. Disclaimers at the bottom. This is a BETA release. Seeking assistance with any/all localizations (deDE, esES, frFR, koKR, ruRU, zhCN, zhTW, any/all others). Aloft is an addon that allows you to customize and enchance how nameplates and nameplate casting bars appear in the game. As of 2014/11/03, I will be on extended hiatus, possibly never to return. If you wish to take over maintenance of Aloft, please contact me via PM. NOTE: Keeping track of which versions of WoW are live on which non-North American realms is difficult; please PM me if you end up with an incompatible version, we can probably find something that will work for you. NOTE: The current production release is Aloft-6.0.1 (Ace3), for WoW 6.0.2+ (Warlords of Draenor, at least prepatched on North American live realms as of 2014/10/14; not compatible with earlier versions of WoW). Aloft-5.2.8 (Ace3) is still available for WoW 5.X. Aloft-4.4.8 (Ace3) is still available for WoW 4.X. Aloft 2.8.3 (Ace2) or later is required for WoW 3.2. Some older versions may or may not still be available; send a PM to Acapela for older versions, and include your email address. - applied various small fixes to avoid using Region:Show()/Hide() on sub-elements of the Blizzard nameplate frame assembly, to improve compatibility with "Healers Have to Die"
! !Tag Error!! Problems? Aloft options have disappeared? Aloft Presets not available or not loading properly?
! !Tag Error!! Issues: If you have "! !Tag Error!!" problems, either enable modules carefully one at a time until the problem(s) goes away, or (especially for custom text tag configurations) look at the document "AloftTags.rtf" (bundled with Aloft, in .../Interface/AddOns/Aloft/AloftTags.rtf), which details which text tags are supplied by which modules. A more detailed procedure is provided below. Presets: Aloft "dynamic" modules must be enabled before presets can be applied to them, and the "AloftPresets" module itself must be enabled before presets can be used at all. (the AloftPresets module is disabled by default to save memory.) A more detailed procedure is provided below. Rinse/Repeat any/all of the above, as needed, to arrive at the desired configuration. Direct support for FuBar (here and here) and LibDataBroker-1.1 are incorporated. 7. Guild Text - Show guild information right on the nameplate. Shows abbreviated forms by default. 11. Combat Text - display all damage and healing done to group members or targets right on the plate. All of the additional options are written to require no additional overhead if they're not enabled (though they will occupy memory when Aloft is loaded). Aloft is designed to be easily extensible. All of the functionality is separated into discrete modules which should make it relatively easy for people to tinker with adding their own functionality. If you want additional texture options, make sure you install SharedMedia. For additional font options, ClearFont2 and its fontpacks provide a number of extra font choices. Documentation for the text tag format is included with the addon (look at the file AloftTag.rtf). Please also look at CREDITS.txt and CHANGELOG.txt for a history of the project. Aloft is still (again?) a work in progress. Defect reports, feature requests, and code reviews are welcome. On behalf of all the original contributors, Acapela hopes you enjoy it. DISCLAIMER: Acapela is not the original author of this addon. Please refer to README.txt, CREDITS.txt, and CHANGELOG_WOWACE.txt for more information on the history of Aloft. Aloft has been updated. It would be branded a "fan update" except the original author(s) have long since vanished, and Aloft is in fact being actively maintained, for the forseable future, by Acapela. Acapela intends to host the addon here at WoWInterface (SVN and distribution). NOTE: The addon is not maintained by Acapela at either of WoWAce or CurseForge (though earlier/"original" versions are still available there). The WoWAce revision on which this version is based is r80814 (http://www.wowace.com/projects/aloft/; this is WAY out of date, now a WoWAce "obsolete" project; the WoWAce version was not transferred to Curse). Please report all errors as they are discovered (either in the comments for Aloft here on WoWInterface, or via the WoWInterface bug report mechanism), and Acapela will attempt to resolve them and apply a fix. Acapela will participate in the forum thread for Aloft at WoWInterface (http://www.wowinterface.com/forums/s...ad.php?t=18093), as well as the commentary associated with the page for the addon itself at WoWInterface. Acapela will continue to participate in the the original official forum thread at WoWAce (http://forums.wowace.com/showthread.php?t=5437). A private message to "acapela" at WoWInterface will also reach him. Acapela does not want Aloft to die, so Acapela will make every effort to find someone to take over should he find himself unable to continue with this commitment. If anyone would be interested in participating in development, please contact Acapela. NOTE: Current users of Aloft should backup/delete their .../Interface/Addons/Aloft folder before installing this version of Aloft. It would also probably be a good idea, to avoid problems, to backup/delete your .../WTF/Account/<WoWUsername>/SavedVariables/Aloft.lua file as well. - CVar in-combat action blocked fix. - Fixed some issues with AutoShow. - added "tapped" as a basic unit type (based on Blizzard nameplate color); options for tapped units under "Health Bar>Colors", "Frame>Background>Background Colors", and "Visibility"
- implemented "class" icons on totem nameplates (using spell icons controlled via the AloftClassIcon module). - fixed a LUA error related to the global nameplate "update interval"
- made AloftHealthBarDeficit an "always load" module. - enhanced Aloft to switch "hidden" nameplates over from zero (0) alpha to "hidden", when combat ends; changed associated Aloft "Visibility" option to "Use Nameplate Alpha In Combat"
- separated Nameplate Glow "invert" logic from Nameplate Glow "explicit low threat" logic, so that they work independently; those of you who "invert" nameplate glows, please help test and tell me if this works "better"
- added "Explicit 'Low Aggro'" options to nameplate glow (primarily for those enabling "Use Nameplate"; this is set to a standard hostile "red" by default, essentially a no-op compared to the usual health bar color), so that those who wish can configure explicit display of "threat status 0"
- changed the meaning of the "Threat Bar>Group Threat Update Interval"; now controls rate of AOE threat processing as well, and a value of 0.0 means "as fast as possible"
- frame backdrop/border/glow graphics now associate positionally with the health bar, instead of the (invisible) "nameplate frame"; facilitates altering the display "height" of the nameplate relative to the associated unit "character model"
- attempted simple initial fixes/workarounds to changes to unit level and name that occur "behind Aloft's back"
- added key bindings for Aloft (enable/disable friendly nameplates), bindings toggling each of enemy/friendly/all; these will replace the default Blizzard nameplate bindings and interact with "Report Status Changes"
And yeah, they redid the vanilla nameplates around WoD time, I believe after my initial comment. Thank you for the tips! 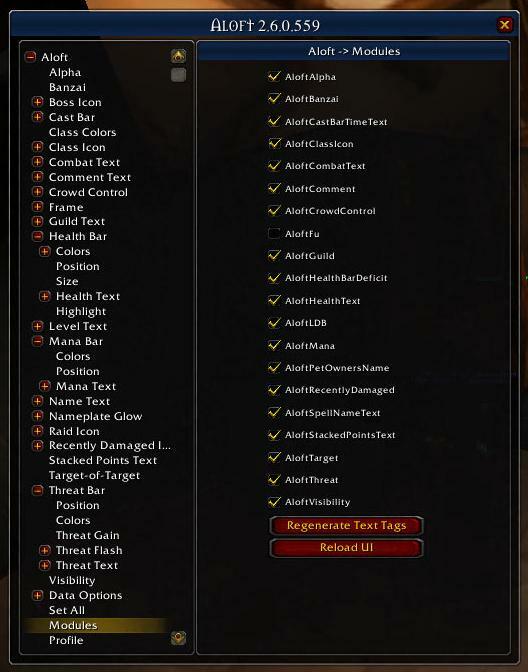 FWIW, my "roadmap" for an update to Aloft, post WoD, was to create a nameplate "re-skinning" addon, as lightweight as possible, which offered no functionality beyond what the default Blizzard nameplates offered, but which offered the user complete control over placement/appearance (bar textures/borders, fonts, colors, custom graphics for things like threat glow/etc, and relative placement of all elements within the nameplate assembly). A comprehensive options menu system would be part of this (as a separate addon which the user could disable for normal gameplay). Given all the fiddly little real-time changes to nameplates Blizzard has implemented, to provide indication to the user of various gameplay events, this by itself could be fairly intricate/difficult. From there, I had intended to add a module to provide a "nameplate API", for use in creating/configuring/placing/operating additional/custom nameplate elements (bars, text fields, additional custom graphics), detecting and notifying changes to nameplates (when they appear/disappear; when they change size/color/etc; when different nameplate elements appear/disappear), performant mechanisms for finding nameplates with certain characteristics (the current target nameplate, or the nameplate carrying a particular unit name/raid icon/whatever), and a centralized mechanism for creating/managing options for these things. Finally, from there, I was going to add "modules" to provide additional functionality not part of Blizzard default nameplates: resource bars (mana/energy/etc), PvE threat (whatever that looks like now), additional cast bar/interrupt warning features, target chaining/early warning, etc, along with options menus that would tie into the overall Aloft options menu, when each module was loaded. A lot of work... in fact it actually sounds like a whole new addon (using Aloft and other nameplate addons as reference)... and I ran out of interest just as I started to think about all of this. And it is possible that the Blizzard's changes to their default nameplates are invasive enough that it might make more sense to start from scratch that try to update Aloft. Anyway, that's pretty much a full brain-dump. Hope it helps. Not interested in returning. I am sorry (though also strangely pleased) that Aloft is missed. Wish I could do something to help. Ha, I can only imagine, having seen the demanding comments all over different addon pages. I have no responsibilities at all in the game and even then it's too much sometimes. Thanks again for coming back to say goodbye! How open is addon code? Does LUA stuff need to be compiled or can you debug it from the actual addon files? Aloft maintainer here... Finally got terminally disgusted with WoW (a mix of how cheesy the game looks, the nature of the gameplay, the nature/frequency of new content, and the hassles encountering other members of the community out in the game world... and though news of WoW's demise are probably premature, it is nowhere near as big a thing as it used to be), and quit playing completely. Not interested in returning. I am sorry (though also strangely pleased) that Aloft is missed. Wish I could do something to help. When I took Aloft over, from Roartindon (original author, with the codebase hosted on the WoWAce website), I did ask permission (though it was months before Roartindon responded), butin the meantime just proceeded anyway. I copied the codebase from WoWAce, dumped the change log from WoWAce (which I incorporated as a text file into the WoWInterface version here, to preserve the history of the original addon), brought it to WoWInterface, and started work. I also reorganized the code slightly so that it could be checked into change control at WoWAce/Curse, and released there, to ease managing the two separate codebases in parallel. I would be very happy to see someone take over Aloft. I would suggest doing something similar: copy the code from the WoWInterface codebase, host it in a new project wherever you want to, roll it into the codebase there (and perhaps dump the SVN change log from WoWInterface here into a second text file to preserve the history of all of my efforts), and get to work. In short, the code is completely open. Do whatever you want with it. Just preserve credit for other people's work, and make sure others can take it over from you under the same terms when the time comes. The code itself is not compiled, it runs inside an interpreter embedded in the WoW game client, and is debugged WITHIN THE GAME. The programming language used is LUA, used widely in industry for embedded systems, and controlled under third-party standards (i.e. NOT a "Blizzard thing"), so you can find technical documentation and tutorials on the language elsewhere. 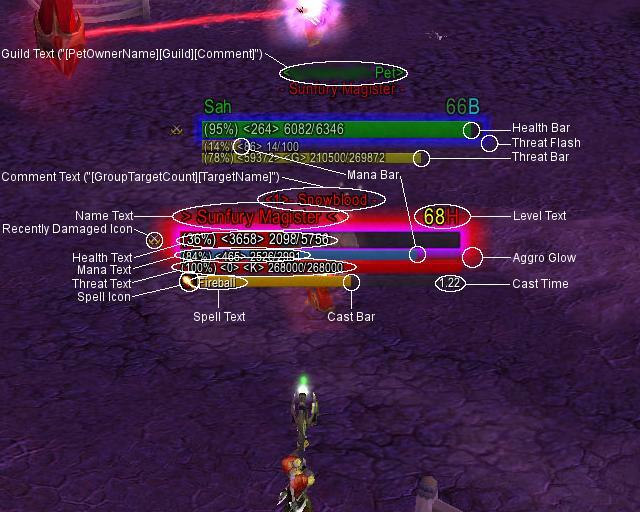 There are Wikis on the web documenting WoW extensions to LUA, and the LUA-based API specific to WoW (including tutorials for common concepts and tasks specific to WoW). My version of Aloft also relies on a variety of other "library" addons, most prominent among them being ACE3 (hosted at WoWAce/Curse). Though there is no debugger as such, compile-time and run-time errors are reported within the game, at startup and during gameplay. Each error report is accompanied by the relevant function call stack, and includes all file names/line numbers within the code, and Aloft is already riddled with very extensive "print statements" for debugging purposes, which in normal operation are all commented out... enable/disable them as needed, add your own, whatever, and watch what spits out in the chat windows as you operate the game. There are also addons for WoW which can help with debugging (the most important, at the time I was active, being BugGrabber/BugSack). Note that the native WoW nameplates are a bit strange now: they change colors and sizes, for instance... stuff that would have to be detected and mirrored somehow. Looked like a lot of work, and I wasn't going to be playing any more, so I didn't really even look at what would be involved. Last edited by acapela : 12-22-17 at 02:08 PM. The great addon that everyone's been using for years is gone. In memory of Aloft nameplates addon. I too miss Aloft so much. After using it since TBC I can't get used to anything else. It's weird how often I think about this addon. Would totally donate aswell. Plater is fine, but it's just not the same. I would no joke put up cash money if someone who knows addons could take a look at resurrecting Aloft! 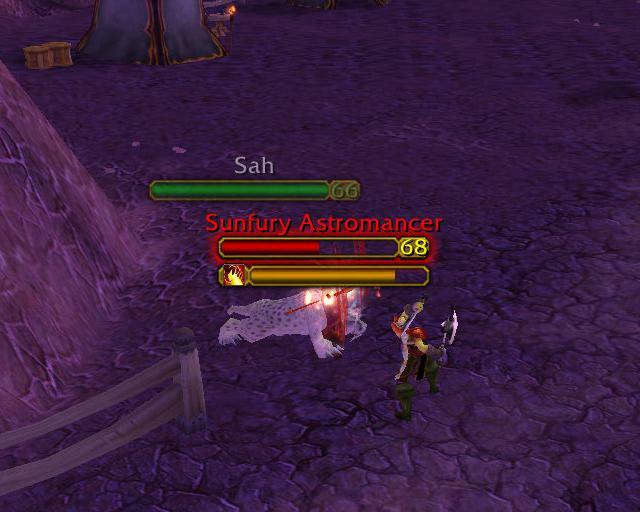 Pls someone save the world and update the best nameplate addon ever! Is it the end of Aloft? I have no idea how to code anything modern, Deadlyz, let's start a collection though. Aloft needs a new Maintainer.. and an update for Legion. Last edited by Deadlyz : 08-06-16 at 03:38 AM. Same! 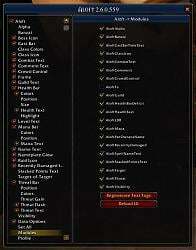 We really need this best addon to work! ready to donate!